In the fourth volume of this loved publication, dedicated to the Greater 'We', ninety contributing writers and artists explore the social, techno, and ecological processes of diversification. The New Farmer's Almanac, Vol IV features essays and stories and poems from farmers, ranchers, ecologists, educators, food bank managers, grocers, gardeners, researchers, and advocates bound by their care for the land, the food system, and the survival of the natural world. There are folk stories, reports on the racialized distribution of farmland, recipes for hickory nut milk and foraged teas. Toolboxes for seed-saving, indigenous land repatriation, and creating liberated space. Advice from old-timers and insights from the new. Meditations on failure, loved crops, and the wisdom of farm dogs. Here are stories about leaving, and of returning home to work the land; essays on the geography of self-discovery; reflections on trauma, both climatic and personal; and some practical guidance for farmers. Add to this hundreds of unique images, from woodcuts to inked watersheds to fine and historic photographs. 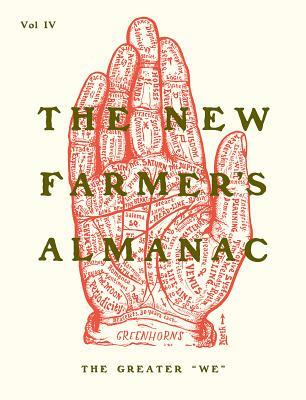 Created by the Greenhorns, The New Farmer's Almanac is a place for public thinking and proactive literary inquiry into the future we share on the land and at the table. Shifting practices is a team sport, and with its original artwork, moon charts, songs, and old-time manifestos, this is just the compendium to inspire your own part in the mix. The New Farmer's Almanac is published by the Greenhorns, a ten-year-old grassroots organization whose mission is to promote, support, and recruit the incoming generation of organic farmers and ranchers. Based in Downeast Maine, the Greenhorns have produced diverse media and publications including films, radio, guidebooks, parties, and exhibits. The new (permanent!) headquarters in an 1896 Odd Fellows Hall has been called "Reversing Hall." Visitors are welcome to our agrarian research library, seasonal workshops, and fun family camping on the saltwater farm down the road. We are nearly to Canada, with acres of wild Maine blueberries, mussels and clams, edible seaweeds, mossy forest in every direction, and dozens of grown-over grandmother orchards to restore and use for cider. Join the mailing list to get our calendar of naturalist trainings and adventures land and sea.